Sunday mornings are my favorite day of the week. There is something so peaceful about the thought of sleeping late, waking as the sun pours into the bedroom windows, and lounging around in my slippers for a few hours. Most of the time, we reserve this only day in the week for creating an exceptional breakfast; one that you wouldn’t normally have time to enjoy during the hustle of the early weekday mornings. Homemade waffles are one of those breakfasts that deems itself special. With just the extra little effort from making a standout batter, the waffle maker does the work. 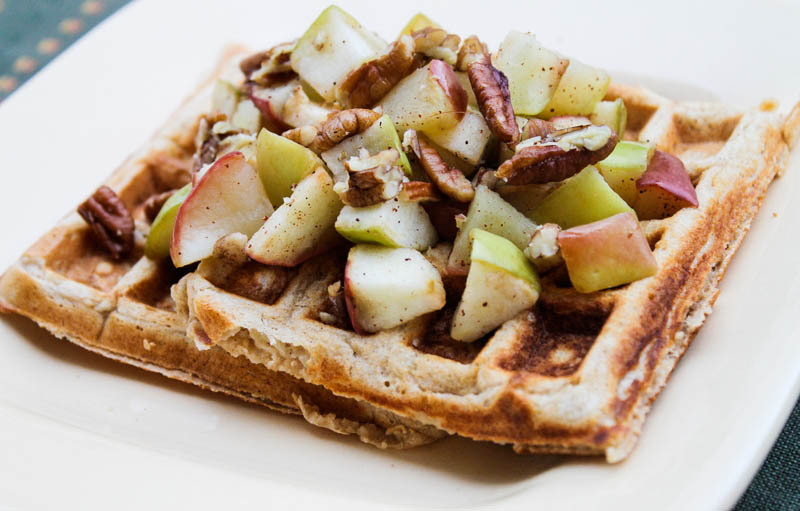 I’ve created these Sprouted Wheat Cinnamon Apple Pecan Waffles in an effort to celebrate fall and the splendor of late Sunday mornings. Put 2 tablespoons of the butter into a small sauté pan and set over medium heat. Once melted, add the diced apples and 1 teaspoon of the cinnamon. Add chopped pecans. Let cook until browned and softened. Set aside. In a medium bowl, beat egg yolks and stir in milk. Add vegetable oil, applesauce and cinnamon. Stir. Preheat a waffle iron and spray with nonstick cooking spray. Pour suggested amount of batter (about ½ cup) onto the pre-heated waffle maker. Close the lid until waffles are done (waffle maker should indicate when done). Plate your waffles and top with the reserved apple mixture.